Discouraged, frustrated, and disillusioned by a watered down version of Christianity, many people are turning away from the Church and their faith. They recognize that neither a sinful world nor a lifeless religion can satisfy their deepest longings and their hunger for something real. The answer is simple-it's Jesus. In Jesus Over Everything, Clayton Jennings strips Christianity down to its bare foundations, revealing the only Truth that has the power to change your life and transform the world-Jesus Christ. In this bold and unapologetic call to action, Clayton examines Christ's teachings and shares testimonies from countless revivals across the country, where thousands are surrendering their lives to Jesus and being transformed by the Gospel. 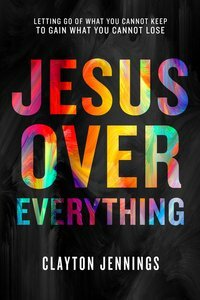 Jesus is everything, so He must be over everything. It's time to put Him first in your life and begin to live in the incredible freedom and divine purpose found only in making Christ your King! Jesus, Jesus, Jesus, till the day I die! About "Jesus Over Everything: Letting Go of What You Cannot Keep to Gain What You Cannot Lose"